About a third of the way into my second viewing of Robin Mineko Williams’ new ballet “The Trees The Trees,” I thought to myself, ‘I love this!’ That response confirmed my initial reaction to the dance the week before, when I saw its world premiere on opening night of Pacific Northwest Ballet’s most recent “Director’s Choice” program. The evening’s first premiere, Matthew Neenan’s “Bacchus,” was a crowd-pleasing, lively, and extremely purple, ballet. Where “Bacchus” is lush and velvety, with a score by Oliver Davis to match, “The Trees The Trees” is spiky, atmospheric, and even a little melancholy. Ultimately, though, for me it's a far more satisfying work. PNB Soloist Leah Merchant with Corps de Ballet member Christopher D'Ariano in "The Trees The Trees." The curtain rises on a sort of abstract, mid-century modern set: a white tree, bench and chair, and a white rectangle that serves as a back drop. Vocalist Alicia Walter enters the stage with Soloist Leah Merchant and the outstanding Corps de Ballet member, Christopher D’Ariano. Walter is singing a series of poems by Heather Christle, which have been set to Kyle Vegter’s score. Although we have the lyrics in our programs, I couldn’t always make out the words Walter sings. That was okay, though. The music meshed perfectly with the movements, conjuring a world where the dancers seem to be searching for connections, for human contact. 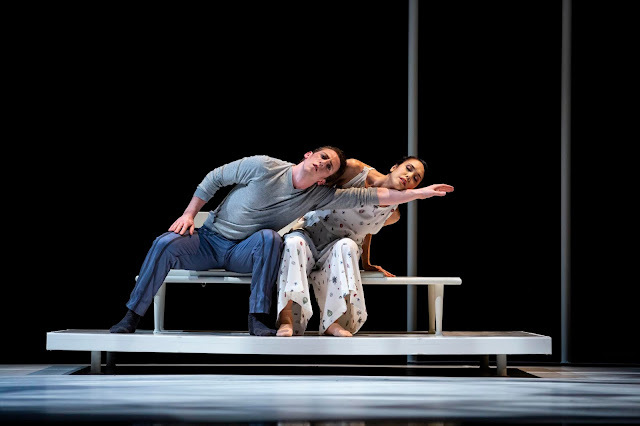 PNB Soloist Ezra Thomson with Principal Dancer Noelani Pantastico in "The Trees The Trees." From the instant Merchant and D’Ariano ooze over the white bench, to Noelani Pantastico and Ezra Thomson’s less liquid pas de deux, to Elizabeth Murphy’s marvelous solo, to Elle Macy and Dylan Wald in a final duet in front of the white rectangle, which has been lowered to obscure the rest of the set, I was immersed in this ballet. Each of these dancers seemed truly and fully invested in the choreography (I ran into Ezra Thomson after the performance and he told me they really were invested because Mineko Williams had involved them in her creative process). The movements themselves were a definite departure from the ballet vocabulary, even contemporary works. First off, the dancers wore socks, including Murphy’s burgundy over-the-knee glories. Secondly, and more significant, Mineko Williams’ choreography seems to emanate from the torso, almost undulating out to dancers’ limbs. It’s the kind of movement you see more typically at Velocity Dance Center or a Whim W’Him performance than onstage at McCaw Hall. And oh, it looked so good on these excellent PNB dancers. I have friends who disdain ballet's attempts to defy gravity, to focus on becoming air-borne. In "The Trees The Trees" gravity rules. 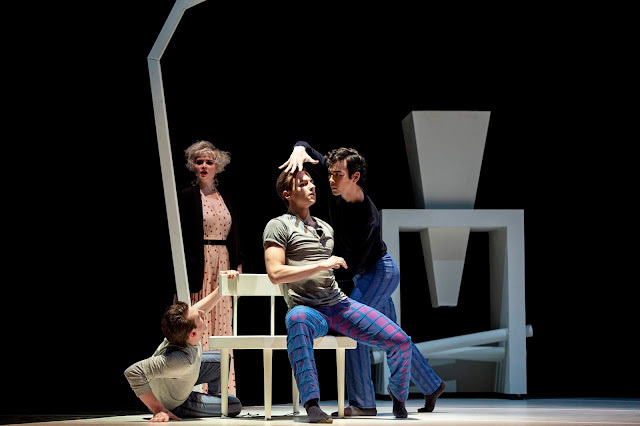 D'Ariano, Thomson and Wald dance a trio on, over and around a white chair. Each, in turn, slithers to the floor, rolls, then lifts himself up to circle back to have another go. Is D'Ariano casting a spell on Wald? Is Thomson watching or trying to intervene? You create the story here and throughout this ballet. From left, PNB Soloist Ezra Thomson, vocalist Alicia Walter, Soloist Dylan Wald and Corps de Ballet member Christopher D'Ariano in Robin Mineko Williams' "The Trees The Trees"
Later on, as I watched the ensemble move forward, one by one, to place their chins to Elizabeth Murphy’s shoulder, gently nudging her toward the floor, I was reminded of the power of the human touch, even in this era where our relationships so often consist of digital “likes.” I've read that, as our interactions move increasingly online, we crave a space to help us understand our purpose, to connect, to dream. In "The Trees The Trees," Robin Mineko Williams and the seven dancers weave a world that caught and held me, and still has me thinking. On opening night, my Millenial companion remarked to me that “The Trees The Trees” felt very much of and about her own generation. That may be true, but this dance also resonated with me, an observer more than 30 years her senior. There’s almost nothing I like better than watching artists who abandon themselves to their material. Especially when that material is multi-dimensional, lyrical and thought-provoking. Well done, Robin Mineko Williams. Very well done cast members. You are watching future choreographers, stagers, artistic directors and (inter)nationally recognised performers here. At least two of them will go on to found troupes bearing their names. You, they, and the audience are all in the middle of (Artistic) History -- and none of you might even know it.